This file graphic illustration released from Japan's Institute for Unmanned Space Experiment Free Flyer (USEF) shows a system of space solar power system (SSPS) which consists of a large solar power generator and transmission panel. Japan's space agency hopes to by 2030 collect solar power in space and zap it down to Earth, using laser beams or microwaves. It may sound like a sci-fi vision, but Japan's space agency is dead serious: by 2030 it wants to collect solar power in space and zap it down to Earth, using laser beams or microwaves. The government has just picked a group of companies and a team of researchers tasked with turning the ambitious, multi-billion-dollar dream of unlimited clean energy into reality in coming decades. With few energy resources of its own and heavily reliant on oil imports, Japan has long been a leader in solar and other renewable energies and this year set ambitious greenhouse gas reduction targets. But Japan's boldest plan to date is the Space Solar Power System (SSPS), in which arrays of photovoltaic dishes several square kilometres (square miles) in size would hover in geostationary orbit outside the Earth's atmosphere. "Since solar power is a clean and inexhaustible energy source, we believe that this system will be able to help solve the problems of energy shortage and global warming," researchers at Mitsubishi Heavy Industries, one of the project participants, wrote in a report. "The sun's rays abound in space." 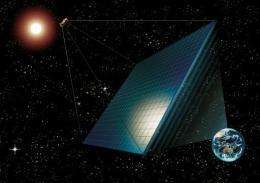 The solar cells would capture the solar energy, which is at least five times stronger in space than on Earth, and beam it down to the ground through clusters of lasers or microwaves. These would be collected by gigantic parabolic antennae, likely to be located in restricted areas at sea or on dam reservoirs, said Tadashige Takiya, a spokesman at the Japan Aerospace Exploration Agency (JAXA). The researchers are targeting a one gigawatt system, equivalent to a medium-sized atomic power plant, that would produce electricity at eight yen (cents) per kilowatt-hour, six times cheaper than its current cost in Japan. The challenge -- including transporting the components to space -- may appear gigantic, but Japan has been pursuing the project since 1998, with some 130 researchers studying it under JAXA's oversight. Last month Japan's Economy and Trade Ministry and the Science Ministry took another step toward making the project a reality, by selecting several Japanese high-tech giants as participants in the project. The consortium, named the Institute for Unmanned Space Experiment Free Flyer, also includes Mitsubishi Electric, NEC, Fujitsu and Sharp. The project's roadmap outlined several steps that would need to be taken before a full-blown launch in 2030. Within several years, "a satellite designed to test the transmission by microwave should be put into low orbit with a Japanese rocket," said Tatsuhito Fujita, one of the JAXA researchers heading the project. The next step, expected around 2020, would be to launch and test a large flexible photovoltaic structure with 10 megawatt power capacity, to be followed by a 250 megawatt prototype. This would help evaluate the project's financial viability, say officials. The final aim is to produce electricity cheap enough to compete with other alternative energy sources. JAXA says the transmission technology would be safe but concedes it would have to convince the public, which may harbour images of laser beams shooting down from the sky, roasting birds or slicing up aircraft in mid-air. According to a 2004 study by JAXA, the words 'laser' and 'microwave' caused the most concern among the 1,000 people questioned. The project poses some serious challenges, like solarcell degradation from micrometeorites and ionisation and I somewhat doubt that the whole venture is viable from a pure economical point of view, but then again, it's been a long time since we've seen some really bold action in space and if nobody dares to break new ground we'd still be walking with sticks. This is really interesting. However, has anyone ever seen a James Bond movie? I wonder if any questions will be raised about this possibly also being used as a giant death ray. Like... Would it be possible for this to be used as a giant death ray? ...I can see it now, some teenage hacker hijacks the controlsystems, because somebody at the lab opened a Paris Hilton email. This contrapture must not in any way come in physical contact with internet traffic, how convenient it may sound for remote control, no routers, no firewalls, only its private network. There are speculations that some of the big power outtages in the u.s. may have been caused by a foreign nation testing its cyberwarfare capabillities. A smart move from Japan. The country itself hase a very dense population. The open space that rest in that country is small. So there is not enough space for solar fields on land. Maybe in the sea... but they obtained for solar fields in space. This is a 40+ yr old idea. It has been studied extensively. Microwave generation, transmission, and conversion back to electricity, today, is far more efficient than any equivalent laser system. The microwave energy density passing through the atmosphere would be relatively low and thus of low toxicity to any birds flying through. However, it has never been pursued because getting all that "stuff" into orbit and assembled cannot be done cost effectively. deatopmg, I agree that that a cost-effective way of getting the materials for construction to the site will be a major burden. But I also worry that power transmission through MW or laser is complicated, and much more research is needed to ensure whatever methods are to be employed, safeguards must be stringently followed so as to cause no harm to the populace and the local ecosystem, something I think were're still a long ways from. Perhaps the first power station in orbit could help to construct successive stations, assuming the microwave beam could be focused enough to power a spacecraft craft coming up. Perhaps lasers could also be used here. The energy would be used to heat propellent gases to very high temperatures, possibly even a plasma state, like with VASIMR thrusters. Payload would be maximized, and fuel loads minimized. Future stations could then be built at far lower cost. Current estimates project the building cost of PV solar sats to be 12 times higher than concentrating solar power plants that are already operating. The cost of CSP solar tower power electricity is expected to fall much lower than other competing types of solar energy. Interesting point. I've been designing spacecraft with external power supplies like lasers for some time. Getting funded is another matter. Still sounds like a weapon to me, lets see, hands up all those who have put their head in a microwave oven. It's probably way more cost effective to situate 10 solar power plants on earth around the equator. The EU is currently trying for 15% solar power to the tune of 400 billion Euros. I'm guessing that for the same amount of money you can only get a tiny fraction of that from GEO sattelite installations like the one proposed. We'll have fusion by then. I saw a TV program exploring the idea of a solar station in orbit where they beamed a microwave from one mountain top to another in Hawaii to simulate the distance between space orbit and earth. The problem they had were: Focusing the microwave beam, Capturing the beam, and the energy loss in transition. The power levels received were significantly lower than those transmitted. Think of a directional antenna broadcasting in one direction. The greater the distance the wider the wave front and the energy density will be less at any given point within the wave front. But still a cool idea! The technology for this is old hat. No one should be doubting it's viability. -Do they use a Maser to transmit the microwaves? -How efficient would the beaming through the atmosphere be? -Wouldn't microwaves heat up the water molecules in clouds? -How are the microwaves received? Is it just an antenna? -What happens in the event of an impact? http://www.physor...731.html but it is expired so I found it from another online source. It seems like a viable source of energy and it looks as if there may be a few nations looking into this as a realistic power adgenda. And i figure that with three or four nations doing the tests for safety the credibility will be sufficient for the public. Death-ray fun aside, if a flock of geese flew through the beam, would they land pre-cooked? It seems to me that it would be much more cost effective, less risky and easier to maintain to just blanket entire cities in solar cells. True, but then you'd have decentralized power - and this must (according to certain business interests) be avoided at all costs. In order to keep making large amounts of money power production must remain centralized and under the control of a few large investors. Well...as long as you don't hit the resonance frequency of other molecules that is. But these are all pretty much known and thus the problem of flocks of geese being cooked in mid-flight could be easily avoided.